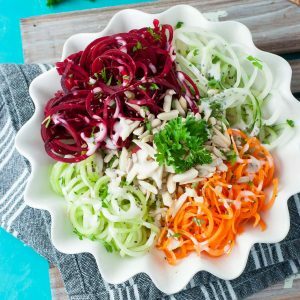 Grab a spiralizer or veggie peeler and whip up this quick, easy, and healthy rainbow spiralized veggie salad featuring beet, carrot, cucumber, and broccoli stalk! 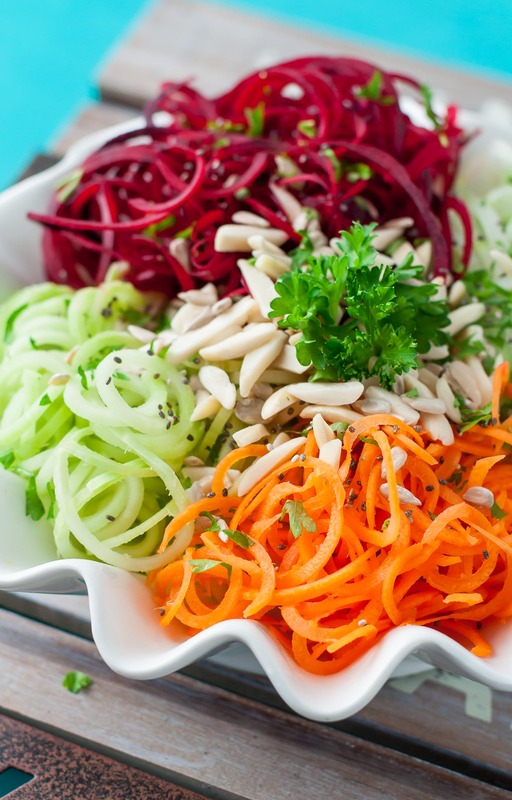 Empty your crisper with this rainbow spiralized veggie salad! Or is it a slaw? Ever since the great soup/stew debate [hello dramatic!] I’ve been doubting my title choices. I’m officially the most indecisive person ever. Here’s the deal, if you serve it atop some yummy grilled chicken or salmon, or as a side to a rocking veggie burger, then it’s a slaw. If you pile it in a bowl and dive in with your favorite dressing and a big ole fork, then it’s a salad. Deal? Deal! I’ve been making a ton of recipes with broccoli florets lately, and I’m 100% opposed to tossing the stalks. I just can’t do it! 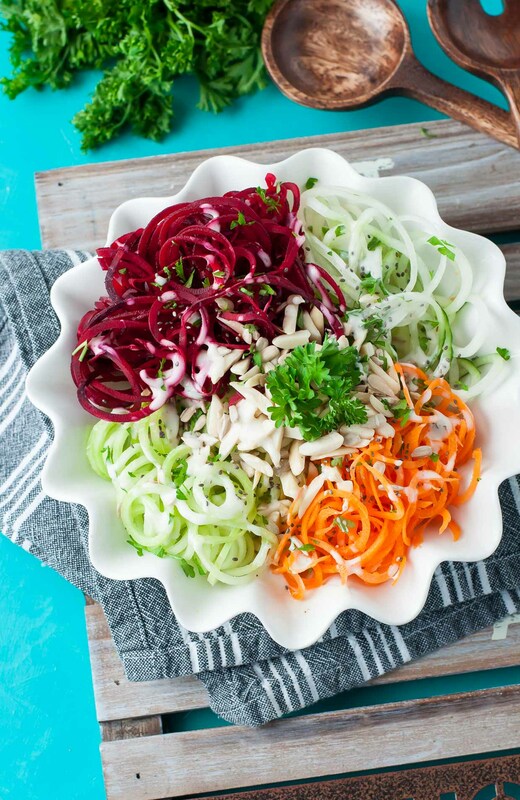 They make fabulous broccoli slaw, a great addition to fresh pressed juice, and now they’re getting the extra-fancy red carpet treatment in this spiralized veggie salad. Grab a spiralizer or veggie peeler & whip up this quick, easy, & healthy salad of beet, carrot, cucumber, & broccoli stalk! Check out the bottom of this post for a few of my favorite homemade dressing recipes! Wash and peel your carrots, beet, and cucumber. Remove the tops from your broccoli if you haven't already used them, and set aside for snacking or stirring into your favorite dish. Since thicker vegetables make the best spirals, remove the thin ends of the carrot as well as a sliver of the carrot top, to make a flat base on both ends. You'll only want the thickest part of the carrot, so save the tip for grating into muffins or for snacking. Break out the spiral slicer and spiralize all four veggies, using the thinnest setting. Pile into a bowl and top with chopped nuts and seeds along with your favorite dressing. I used ranch for mine [the craving struck!] but I'll throw some links to other dressing recipes at the bottom of this post for ya! Since this is a salad, it totally goes without saying that you can customize it to your heart’s content. I’m simply here to give you that little nudge to break out the veggies and have fun with it! I get bored of the same old salads over and over, so breaking out my spiralizer is usually the easiest way to switch things up around here! Though this salad would be equally awesome shaved into ribbons with a veggie peeler, no fancy tool required! 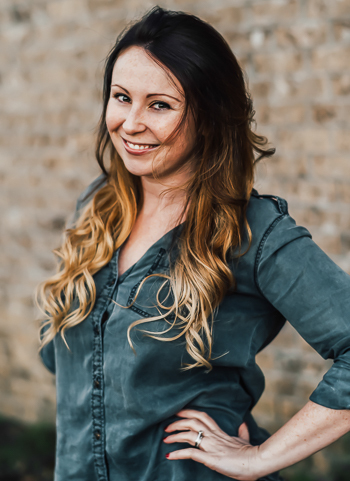 Sooooo… what are you waiting for? This post contains an affiliate link for my favorite spiralizer – I’ve been using this exact one for 5+ years now; we’re BFF at this point! How pretty! I don’t throw my stalks away either! No wasting good veggies here…. I’ve never spiralized beets before, but man that is pretty! Need to do that next. This salad looks so beautiful. Love how the colors blend so nicely together on the fork!! Gorgeous! Just made some avocado ranch dressing last night. Can’t wait to try some on this salad! What a cleaver idea to use the stalks. How did you do the beets? I love beets but would love to hear your tricks for a mess free (if possible!) way to spiralize them! It wasn’t as messy as I thought! Using raw beets helped, when they’re cooked that juice gets everrrryyyyywhere! I used a really sharp peeler to peel it first then spiralized it in seconds, it was as easy as the cucumber was! My favorite sushi restaurant serves spiral beets as a garnish and I can see why! They’re awesome! Delish! I’ve been buying pre-packaged broccoli slaw and boiling it a bit to turn it into veggie pasta. Easier than using a spiralizer for sure! 🙂 Thanks for sharing another healthy recipe with us. Happy Valentine’s Day! slaw, salad…whatever you call it it looks delicious to me!! I want a spiralizer so badly! Now I want to go spiralize everything in my kitchen and make a pretty salad like yours. Yum! Oh I love how colorful this salad is! And the swirls just make it even better 🙂 I need to order a spiralizer!! This is fantastic!! I need a spiralizer sooooooo bad. Desperately. Amazon – here I cooooome…. That salad looks SO good! I seriously just wanted to reach into my computer screen. Love it! My mom always said to eat the rainbow. I of course didn’t listen and refused to eat veggies until I was an adult. Hopefully Chickpea won’t be as bull-headed as I was. This looks lovely. She’s pretty stubborn, but luckily it’s been in my favor for the most part. She is unsure of green things yet LOVES green onion, pesto and asparagus. Broccoli has to be in pesto, peas must be in pesto, and kale has to be in chip form for her. Ok she’s not really that picky I guess haha! Let’s hope her foodie adventures surpass ours as kids! <3 Love ya lady!